Alright, so I’ll start off with my qualms about the title. If there’s one thing I do know very well about Sonic, its that he’s fast and the thrill of zipping through levels at high speeds is what I was looking forward to the most. However, while that thrill was definitely satisfied at times, I often felt that going fast put me at odd with the levels. Running into enemies, falling off platforms, getting caught in traps, I felt like whenever I tried to push past the speed limit, things like these soon led me (technically Sonic) to my death. Only by slowing down was I able to properly overcome such obstacles. This covers my main issue with the game so now we’ll move on to greener courses. 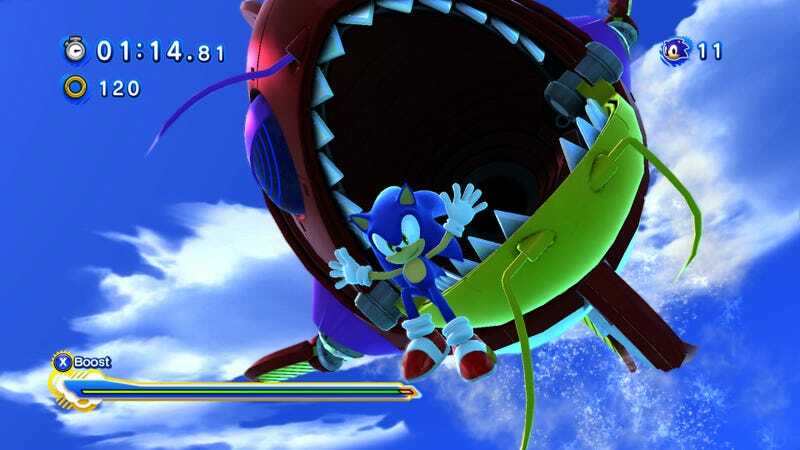 I did say at times that the whole thrill of going fast worked and the best examples were the boss battles. While none were thoroughly memorable, they were fun, a decent challenge and most importantly worked with Sonic’s whole speed thing. I also really like the variation in gameplay between old and new sonic though in the end I do prefer the new one. While there are only a few main levels, a ton of challenges are available to play through I haven’t checked out all of them. The best for me were the ones where Sonic’s friends helped out as they provided a new mechanic to play with. That’s it for the gameplay and as for everything else, the soundtrack had a fun, upbeat vibe going for it which fitted well with the levels, I especially liked the song ‘Escape from the City’. The story was a simple affair, it was fine and that’s all there really is say about it. Graphically, all the stages and such looked quite nice and vibrant and I liked the fact that the stage select screen was a stage in itself. Well that’s that on my take, as always I’m happy to discuss more if you wish.